Pitts for Sale - NOT! Pitts S-1C For Sale - NOT! It was with great regret that I was forced to sell my lovely Pitts S-1C, due to unfortunate events beyod my control. She was purchased by a lovely and charming woman named Sandra Perkins, from Northants, England. Fifinella is to be based at a WW2 bomber base, Deenethorpe Airfield, in company with some other aerobatic kindred spirits, including a Christen Eagle and another Pitts. 160 hp Lycoming O-320-D2B. 430 TTAF, 430 STOH. This airplane was built by Gordon Goodrich of Wisconsin in the late '70's. 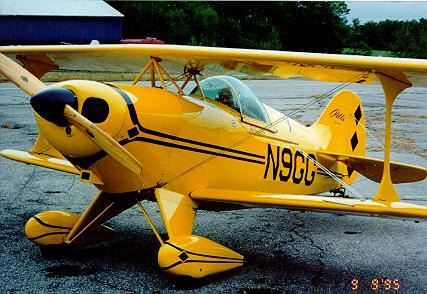 It was flown in airshows as "The Bumble Bee Special" by Kenny Blalock in the early 80's. It was owned by Jean Hardy of Littlebrook Airpark in Eliot, Maine, from 1989 until I bought it in September 1995. Fifinella has a gorgeous yellow and black Airtech Coatings urethane paint job, done in 1992 by an A&P/IA, Loren Harmon. The airplane displays beautiful workmanship, with very nice wood instrument panel and wood turtledeck front, and very neat welds. She has a number of nice touches, such as linkage-type throttle instead of cable, and steerable, full swivel tailwheel. Fifinella cruises comfortably at 135 mph. She weighs 679 pounds empty, and has a gross weight of 1080. She has an 18 gallon fuel tank, inverted fuel and oil systems, and a smoke system. Fifinella has an electric starter and battery, but no alternator, making operation without a transponder quite practical. She gets 20 to 30 starts on a fully charged battery, which charges up overnight. A lexan floor panel, new brakes, new flop tube and O-ring, and a new fuel tank sight gauge were installed in April 1995. The pressure carburetor was rebuilt in 1992 at 363 hours, and a newly rebuilt Airtech crankshaft and new main bearings were installed at that time. A new wooden prop was also installed at that time. Exhaust valves were converted from 7/16" to 1/2" at top overhaul. Compression readings at the latest annual in September 1995 were 77/80, 78/80, 74/80, 74/80. Fifinella is a beautiful airplane, in excellent condition, having been professionally and meticulously maintained. With her big Lycoming engine, light weight, and flat-bottomed wings, she accelerates like a rocket and climbs like a bat out of hell. She is an absolute blast to fly! In 1995, my prepurchase inspector said that this airplane is one of the best of its type. She has been babied all of her life. Because of the low time and meticulous maintenance, Fifinella represents a rare opportunity for low-cost aerobatics fun. She is capable of competing at up to the Intermediate level. Financial pressure forces me to sell Fifinella, very much against my will. I love this airplane! Check out more details about my Pitts, and look at a gallery of Pitts Photos. If you want to see her, here are directions to Littlebrook Air Park.